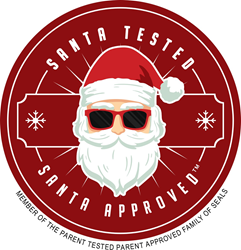 Top Awards Organization PTPA Media Inc. today reveals the first award recipients of a new and highly-coveted Seal of Approval: Santa Tested Santa Approved. This Seal of Approval is the newest member of the PTPA family of certifications. This certification highlights great products specifically curated for the holiday season. Our winners have been selected by an enthusiastic group of consumers, chosen from our community of holiday-loving parents, in order to determine which products best capture the magic of the season and fulfill their shopping needs for the holidays. Winning products were represented in a number of categories from prepared desserts to the perfect gifts for family, friends and even pets, there was something to be enjoyed by all. "At PTPA Media, we are proud to play a role in certifying innovative products that families can trust," says Sharon Vinderine, Founder & CEO of PTPA Media. "Over 83% of consumers say that they make their purchasing decisions based on peer recommendations. Seeing a peer based certification like ours on a product helps consumers make informed purchasing decisions on something other than price points. If your peers loved it, there is a high likelihood that you will as well." For more information visit http://www.ptpamedia.com.